Fresh from an 18-month tour of his award winning Il Dego show, Jason Chong returns to the Melbourne International Comedy Festival with a brand new show. You know Jason from The Project, Today, The Footy Show, NOVA and SAFM, now get to know Jason Chong’s Mum. 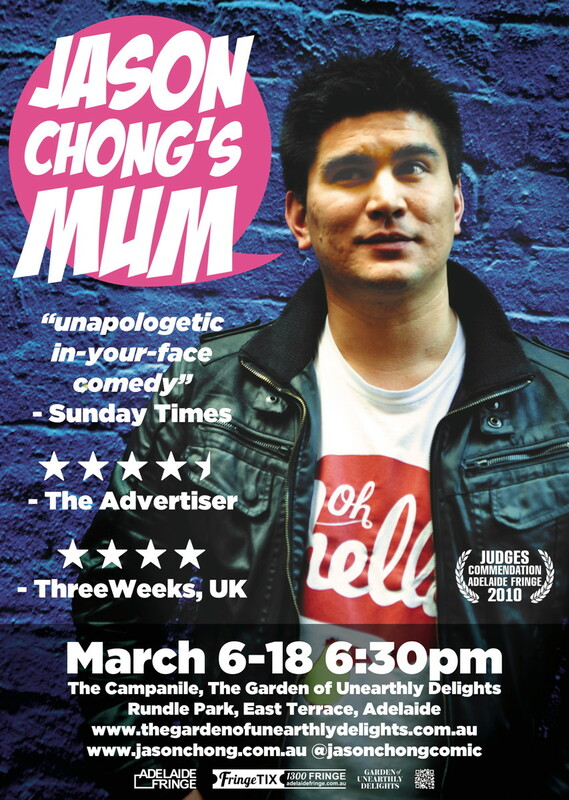 The fact that Jason Chong has named his show Mum solely for the fact that he enjoys the idea of people being able to request “two tickets to Jason Chong’s Mum”, is a testament to Jason’s quintessential comedic outlook. ‘You’re welcome,’ he writes about the little giggle he has be-gifted his audiences with upon ordering their tickets. Chong’s 2011 show Real Life featured him discussing ‘Chongplicity’ with two other projections of himself . His originality is widely acclaimed, yet he is masterful at even the most basic comedy practices like timing. Jason Chong is ingenious, you simply must get inside Chong’s Mum. Go on, there’s room for hundreds.